Invacare Deluxe Wide Three Position Recliner is designed for maximum comfort for users who need a wider seating surface. The special padding technology provides a long life of comfort and support for the seating surface and back of the recliner features lumbar support for maximum comfort. A convenient push bar on the chair back and four rolling casters allow for easy movement. 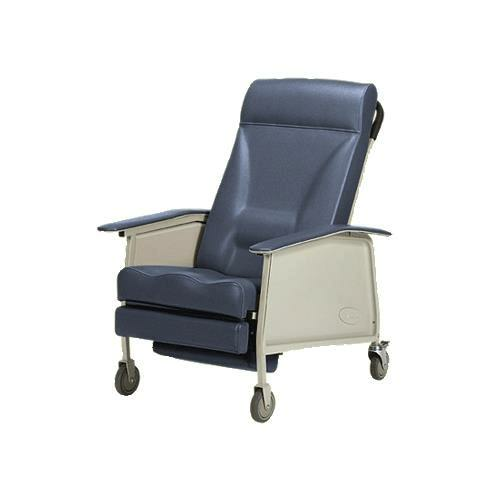 The full-recline, leg-ottoman elevated and full upright positions provide maximum comfort for patients. This product is backordered from the manufacturer and will ship once it becomes available. 1. Remove back frame with back cushion from its carton. 2. Lock the rear casters. Work from the rear of the recliner base. 3. Ensure that footrest is in closed position before installing the back frame with cushion. 4. Lift the chair back in an upright position behind the rear seat cross brace. 5. Slide the back tubes into the open tube ends of the rear seat cross brace. 6. Lift the plastic skirt mounted on the bottom of the seat and align behind the rear seat frame crossbrace. 7. Align the holes in the skirt to the holes in the chair back by fastening the hardware. 8. Securely tighten the two hex screws to secure the back cushion to the back frame. 1. The chair cannot recline if the recline lock bar is engaged. An assistant must first swing recline lock bar up to the chair back and lock into position. 2. While seated in the recliner, grip the armrests and simultaneously lean body weight back and push forward with your arms until a recline position reached. 3. The footrest will lift automatically when the chair back reclines. 4. The occupant should not be required to exert excessive force to change recline positions. If the recliner exhibits difficulty in reclining, an attendant should be called for assistance. Seat To Back Height 34"